On the evening of 31 January, 1941, at 7 pm (British Time), Josef Jakobs departed Schipol Aerodrome in Amsterdam in a two-engined German aircraft. The three-man air crew flew the plane toward England and at 8 pm, over fields of Huntingdoneshire Jakobs jumped from the air craft at an elevation of 3000 feet. Jakobs had injured his ankle upon departing the air craft, an injury that was compounded when he landed in a farmers field southwest of the town of Ramsey. Unable to move, Jakobs covered himself with his parachute and awaited the dawn. At 3:30 am, after firing some shots into the air, Jakobs was found by two farmers who quickly summoned the Home Guard. The Home Guard and police reports noted that Jakobs the items that Jakobs had in his possession. In regards to his descent from the air craft, Jakobs was equipped with a camouflage parachute, a light brown flying suit, a steel helmet with German markings, a small hand spade (15" long) and a pocket knife marked swing. The pocket knife would have been useful for a parachutist to cut themselves away from their parachute gear. The hand spade was provided so that the would-be spy could bury the parachute, harness and flying suit, thereby escaping detection for as long as possible. Interestingly, the Imperial War Museum in Lambeth, London has a display of some equipment found with the German spies, including a small hand spade. The steel helmet (also called a crash helmet by some of the police involved) worn by Jakobs was most likely identical with the one currently on display at the Imperial War Museum (IWM). The helmet was one used by German paratroopers and the steel shell included a liner and chin strap. The light brown flying suit worn by Jakobs would have probably been identical with the one also on display at the Imperial War Museum. He would have worn it over his regular civilian clothes. Unlike German paratroopers, Jakobs was not wearing high-sided boots but regular black shoes, which may have played a contributing factor in his ankle injury. Jakobs was also equipped with a large camouflage parachute. The parachute on display at the Imperial War Museum (and the other items in the display) are from an unknown German spy. The parachute would have been a round one and had one riser extending from the body harness to the parachute. US and British parachutes typically had four risers extending from the harness to the parachute, which allowed for some manipulation of direction. The German parachutes were not maneuverable. 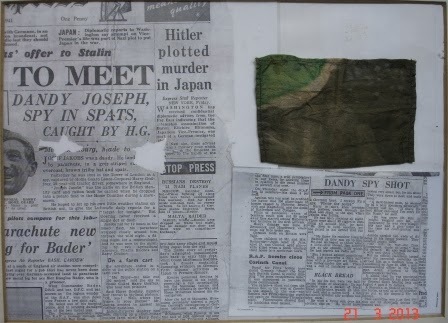 While the location of Jakobs' parachute is unknown, a fragment of it is on display at the Ramsey Rural Museum in Huntingdonshire. of German spy Josef Jakobs, including a fragment of his camouflaged parachute. Accompanied by some of the newspaper articles that were published upon the execution of Jakobs, the fragment is not large. Its provenance is unknown but presumably one of the farmers and/or the Home Guard cut off a fragment as a memento of their historic discovery. 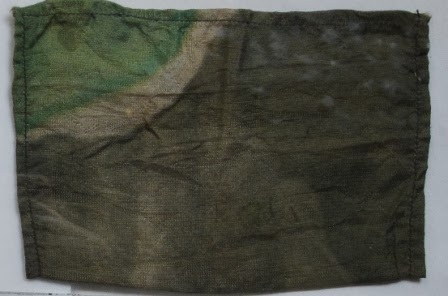 Ramsey Rural Museum - close up of fragment of camouflaged parachute used by Josef Jakobs. According to one military historian, many of the MI5 officers involved in the interrogation of German spies would keep the equipment of the hapless spies as souvenirs (flying suits, parachutes, etc.). Perhaps the remainder of Jakobs' parachute ended up in a private collection. Or perhaps it lies mouldering in unreleased MI5 boxes. It's last known sighting (along with the flying suit and spade) was on August 4 and 5 at the court martial of Josef Jakobs.